Earlier this month, the winery broke ground on the new Visitor Center which will overlook its beautiful historic estate vineyards – FAY and S.L.V. 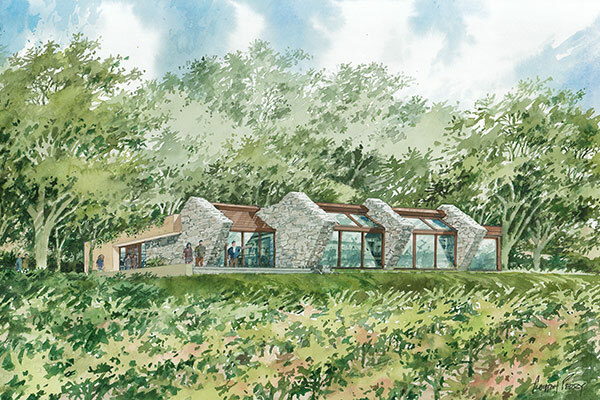 Barcelona-based designer Javier Barba and local architect Dan Macdonald joined with winery principals to reveal the watercolor rendering of the new Visitor Center by artist Clayton Perry. The artwork, which was signed at the ceremony to commemorate this major milestone, will be displayed in the current tasting room for visitors to enjoy until the new 6,000 square foot Visitor Center is completed during the 2014 harvest. New Visitor Center Watercolor Rendering by Artist Clayton Perry 2013.